Shiroishi is in southern Miyagi Prefecture, and the southern peak of Mount Zaō is within the city borders. The area of present-day Shiroishi was part of ancient Mutsu Province and was under control of the Date clan of Sendai Domain during the Edo period. During the Boshin War of the Meiji Restoration, Shiroishi Castle was the site of a fierce battle between the pro-imperial and pro-Tokugawa forces. Today Shiroishi Castle is a popular tourist destination in Miyagi and it's especially beautiful during hanami. The train line to Shiroishi is the Tohoku Honsen. Tickets are 760yen (one-way) and you can use Suica. It takes 45-50 min. to get to Shiroishi from Sendai. There are express trains that take about 40 min. Shiroishi has a Shinkansen station called ShiroishiZao. The shink to Sendai takes 15 min. and costs about 1500yen one-way. The Shinkansen to Tokyo takes exactly 2hrs and costs 10000 yen one-way. Shiroishi has a toll road interchange. You can take the local road (route 4) all the way from Sendai or use the toll road. There are many shopping centers, book stores, electronic stores, foreign food restaurants, supermarkets, video rental stores, etc. Yamaya (foreign food, cheap booze), Tsutaya (videos, CDs, books), Bookoff (books, manga), and the 100 yen shop. There's also a Yamada Denki on route 4. The Southern Miyagi JETs usually have ramen on Tuesdays at Ramen Unjyarage (らぁめん うんじゃらげ), located near ShiroishiZao Station. This place is known for its unjaramen which is a broth-less ramen bowl that comes with meat, bean sprouts, and other small veggies. Smile Hiroba ART/MUSIC festival (2nd Sat of every month. Two local onsen spots: Obara and Kamasaki. It's great for beginners and advanced skiers/snowboarders. You can get there by a free shuttle bus or you can drive for about 30 minutes from ShiroishiZao Station. 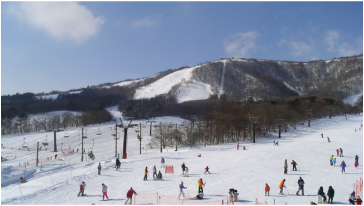 Shichikashuku and Eboshi Ski resorts are also quite close to Shiroishi! They are about a 30-45 min. drive from the station.